There are so many good video games out right now, which means there’s so much good writing about video games, too. Worth Reading, our weekly guide to the best commentary and observations about games, is here to help. Many folks play Metal Gear Solid games with the expressed purpose of not killing anyone. That’s generally my strategy, though I don’t have a problem downing some fools if they get in my way of finishing the mission. Joshua Cauller avoids death, as well, but for a different reason: in a way, it allows him to express (and practice) his religious tenets. Given he’s a writer for Game Church, it’s not a surprise to see his work has a Christian bent, so I’d like to hope the comments below will respect that, even if you don’t agree with his views. After marking my enemy and crawling several dozen meters on my belly, I sneak up and grab my enemy by the neck. I put him in a sleeper hold until he passes out, strap a Fulton Extraction balloon to his waist, and send him flying away to be recovered by my cargo airplane. A few minutes later, I get confirmation: he’s one of us now. Suddenly we’re forever friends. It’s ridiculous and short-handed, but it plays into something I long for. I’ve always wanted to play a game that let me love my enemies as Jesus might. MGSV becomes this enemy-converting power fantasy where I get to preserve the lives of my enemies, offer them a job, and promise to fight for them when they come under attack. We become allies. I know in the real world no abducted enemy would ever be so quick to turn sides and join his opponent’s forces so easily. But I can’t help but feel like Metal Gear Solid 5: The Phantom Pain allows me to love my enemies as I believe Jesus might. I mean the way Jesus told us to love our enemies in the Gospel accounts isn’t something that comes up terribly often in games. So even when it’s simplified in The Phantom Pain it feels like a win. The horror genre has...problems. While it’s my favorite, I’m not blind to its issues, especially in regards to its treatment of women. Until Dawn tries to address this with an ample number of female characters and turning some horror tropes on their head. 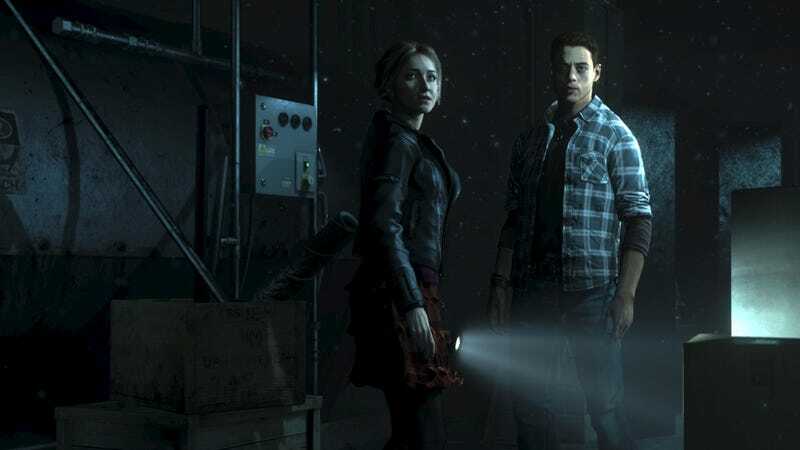 But while Bianca Batti says Until Dawn makes some of the right moves, she’s also critical of what it doesn’t allow for. Specifically, as a game all about player choices, it doesn’t give players an opportunity to disrupt certain story arcs, such as the stereotypical cat fight between two exes. It seems to me that a lot of people talking about the gameapplaud it for being “genre-changing across the board… in terms of narrative and design innovation” or for allowing “you, the player, [to] finally make all those decisions you’ve been shouting at the screen for so long, every time an idiot does something wrong in a horror film and gets themselves killed as a result.” But do we really get to make all those decisions? Or is what we’re dealing with here, in part, the illusion of choice? Ed Smith took a close look at Resident Evil 2’s police station setting. Stu Horvath reflected on his grandmother, and how she helped him reconsider his fear of missing out. Caroline Siede killed this piece about the reason for feminist critiques. Michael Clune explained how games helped him recover from heroin. Tom Orry reviewed Dropsy...and revealed his own circus past. Mattie Brice broke down what “Hot Ryu” says about masculinity. Jordan Wood examined the sexual politics of Witcher’s Bloody Baron quest.